Those who are aware of Richard Nixon’s poker playing might know about his having played while a Naval officer stationed in the south Pacific during WWII, including perhaps the curious detail that money won by Nixon from those games of draw and stud would later be used to help fund his initial Congressional campaign in 1946. Once he’d begun his political career, Nixon continued to play poker with fellow Congressmen in weekly games, and would keep playing in those games -- albeit less frequently -- during his two terms serving as Dwight Eisenhower’s vice president (although he never played with Ike, himself a skilled player by most accounts). After losing the presidential election to John F. Kennedy in 1960 and then also the race for governor of California two years later, Nixon and his family moved to New York where he worked in a law firm over the next stretch -- the “wilderness years,” as this period out of the public spotlight is sometimes called. Nixon joined several prominent men’s clubs in and around New York, more than likely playing poker occasionally when visiting them. That said, he was kept busy doing quite a bit else during that time, including frequently traveling abroad, and once the campaigning for the ’68 election began in earnest, he likely played very little. While president, Nixon played even less frequently, with the most likely context for such games occurring when away from the White House, in particular when visiting the home in Key Biscayne, a.k.a. “The Florida White House” to which he took trips on more than 50 occasions during the five-and-a-half years he was in office. Nixon bought the home in 1969, not long after taking office, which was located near the residences of his two closest friends, Charles “Bebe” Rebozo (pictured with RN above) and Bob Abplanalp (below). 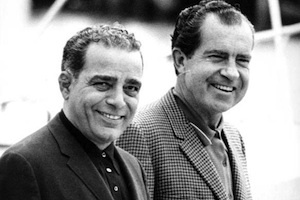 The son of Cuban immigrants, Rebozo was a banker and businessman whom Nixon first met in 1950 (in fact they were introduced by the Congressman from whom Nixon would later by the Florida home). Nixon met Abplanalp later during those New York years. 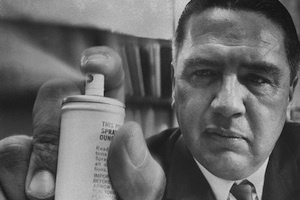 He was an inventor credited with coming up with the aerosol valve, an invention which helped him to extreme wealth. Both names are so unusual -- appearing as they do amid Nixon‘s already exceedingly unusual story -- they almost seem as though invented, like a couple of Thomas Pynchon characters. References to the trio often mention poker -- along with fishing and drinking -- as a favorite pastime. An article in Sports Illustrated from December 8, 1969 focusing on Abplanalp’s fishing exploits mentions his special affinity for poker as well as his friendship with Nixon, although doesn’t specifically refer to poker games between them. In January 1974, Hunter S. Thompson wrote a piece for The New York Times called “Fear and Loathing in the Bunker” in which he correctly predicts Nixon will be resigning, envisioning as he does a post-presidency scene in which card playing is one detail. “If I were a gambling person,” writes Thompson, “which I am, whenever possible -- I would bet that Nixon will resign for ‘reasons of health’ within the next six months.” The cited cause of the resignation isn’t accurate and it would take a couple months longer, but otherwise Thompson’s bet was a good one. A 1977 article in People repeats the reference to Rebozo, Abplanalp, and Nixon being “fishing, drinking and poker buddies.” And many accounts of Nixon’s first learning about the Watergate break-in while in Key Biscayne depict him relaxing following the first Moscow summit with his friends, in the midst of seeking escape in a friendly game of cards when first reading the news of the DNC break-in and arrests. If poker were played between Rebozo, Abplanalp, and Nixon, no details from those games survive. Nixon said nothing about them, and his two “confidants” were both consistently unwilling to divulge details about their friendship with the president or the time they spent with him. In fact, a profile of Abplanalp appearing in the March 5, 1971 isssue of Life magazine suggests that despite the inventor’s fondness for poker, he and Nixon had never played at all. “Oddly, according to Abplanalp, he and the President do not play cards,” it says. “Abplanalp loves poker, gin or hearts, but he says he did not know Nixon had a reputation as a poker player until he read it in Life” (referring to a famous profile of RN that had appeared about four months before). Any cards those three might have played would have been strictly for entertainment, I tend to think, a far cry from the approach Nixon took when winning thousands as a Naval officer some three decades earlier.